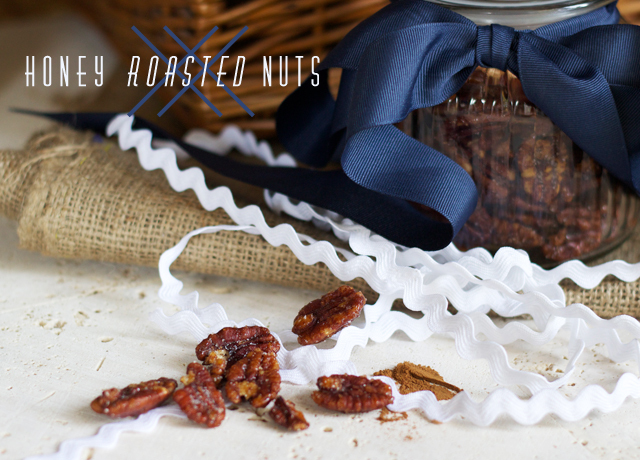 For a Christmas hamper || Honey roasted pecans & cashews. 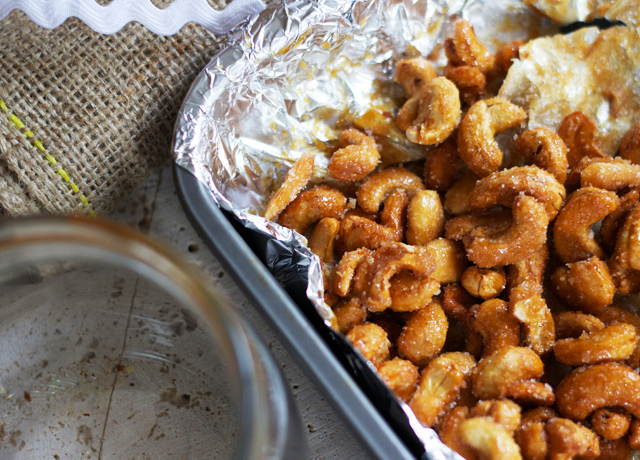 Making honey roast nuts has been my first venture into the world of cooking-with-kinda-caramel, and here’s what I learnt. But enough rules now, let’s get to the goods! And oh man, are these good?! Crunchysweetsaltybuttery all at once (new word, note it down) and basically the most moreish things I’ve ever made. The cashew ones were *crazy* good, and the pecans would be amazing smashed up and crumbled over good-quality vanilla icecream as a light Christmas dessert. They’ll keep well for about four weeks in an airtight container, so feel free to make them now for inclusion in a Christmas hamper in a few week’s time. 1. Preheat the oven to 160 degrees celsius, and line two baking trays with tin foil. 2. 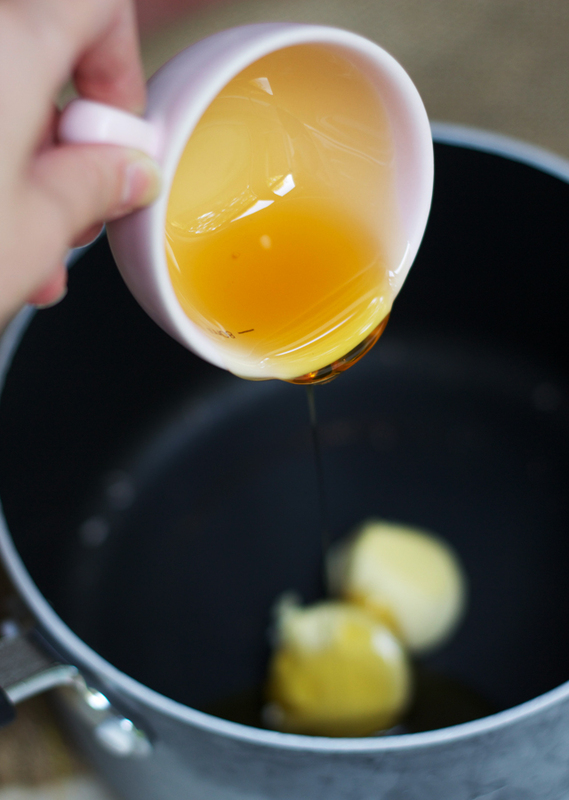 Put the honey, butter, cinnamon, and half the salt into a saucepan, and melt gently over a low heat until smooth and combined. 3. 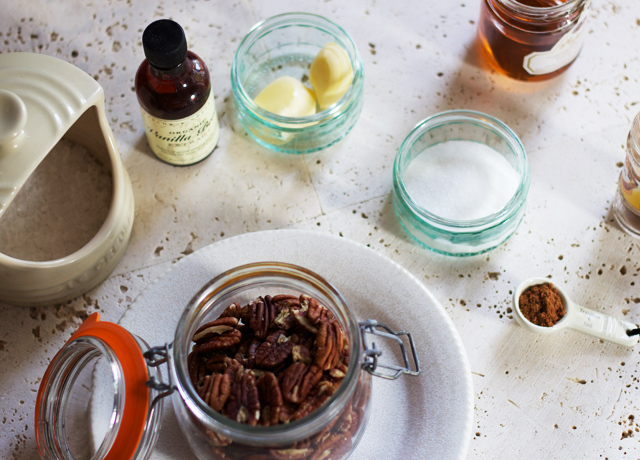 Divide the honey mixture between the two types of nuts, mix well to ensure the nuts are evenly coated, and then tip onto their respective baking sheets. Spread them out into a single layer so that they cook evenly. 4. 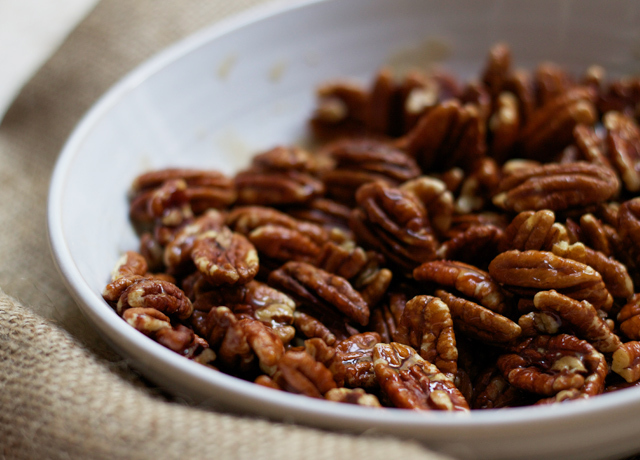 Roast the nuts for 15-20 minutes, until the honey mixture has thickened and coats the nuts like a caramel. Stir every five minutes throughout cooking to make sure the nuts roast evenly. 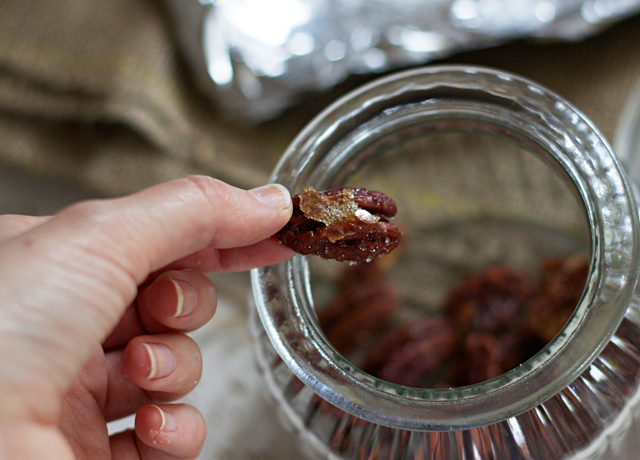 I found the pecans took a scant 15 minutes to cook, and the cashews around 17 odd minutes. 5. 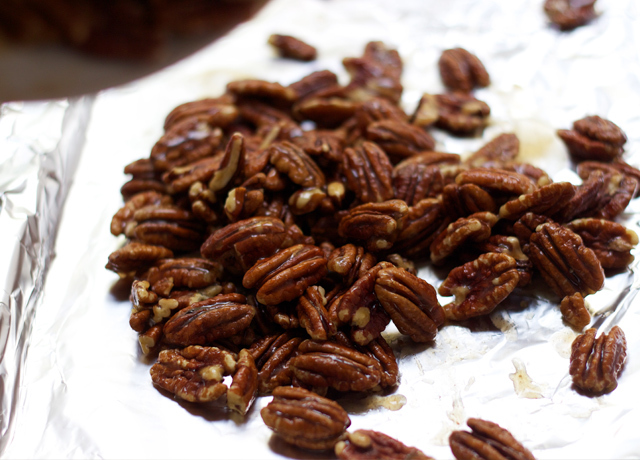 Take the nuts out of the oven, and once they’ve cooled for a minute or so divide the remaining half teaspoon of salt and the 1/4 cup granulated sugar between the pecans and cashews. Allow to come to room temperature, stirring frequently to ensure they don’t stick together or to the baking trays. 6. Store in airtight jars or similar containers for up to four weeks. oh my yum! 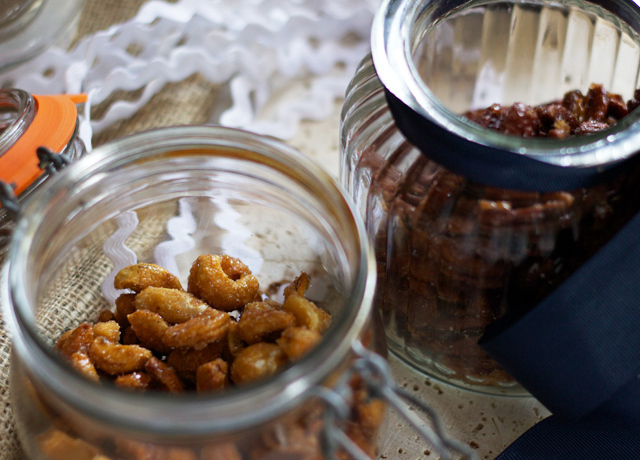 I always get the candied walnuts and pecans from the christmas/continental markets, def going to try these to make my own. Oh these look delicious, I really want to make some now! I will definitely be making these! I’ve just had 42 jars arrive for Christmas goodies. YUM!! 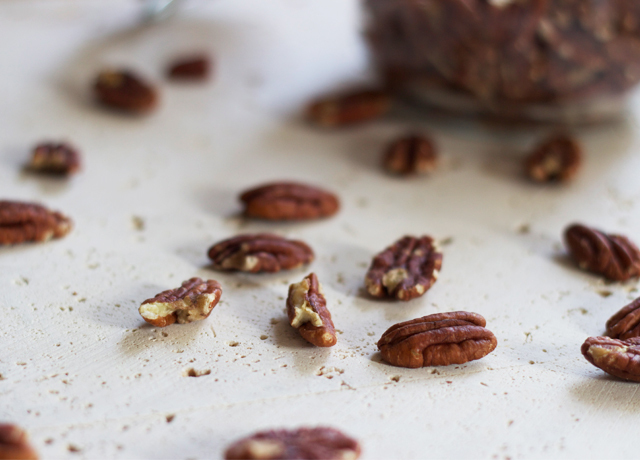 On of my favorite things is cinnamon pecans – I’m sooo going to try this recipe out! These sound so delicious!!! I think all of my taste buds would be gone if I made these- I just couldn’t resist eating them hot out of the oven/boiling hot sugar mixture! These sound delicious! I’m a sucker for anything sweet during the fall and winter. These would even make great gifts farther into the season. your pictures are so good. everything looks so festive. I’d thought about making up Christmas hampers for presents this year. This recipe has made that idea ever more tempting! What a gorgeous idea, these would be a lovely thing to keep you going on Christmas day! Beautifully photographed too.